A/B tests are a type of test in which the effect of multiple page designs on the result can be reported. A/B tests are the first and simpler of two types of tests performed with the Google Website Optimizer. Unlike their name, the A/B tests also allow you to test more than 2 options. In the A/B test, it is observed which of the pages to be tested according to the pre-determined measures perform better. In the test with two alternatives, the original page is called the control, and the new alternative page tested is called the test. It brings an end to the arguments related to the design between the departments such as thinking what would provide a better conversion rate during a promotion on your website, just like the typical question “Should it be ‘Buy one, get one free’ or ‘50% discount’?”. 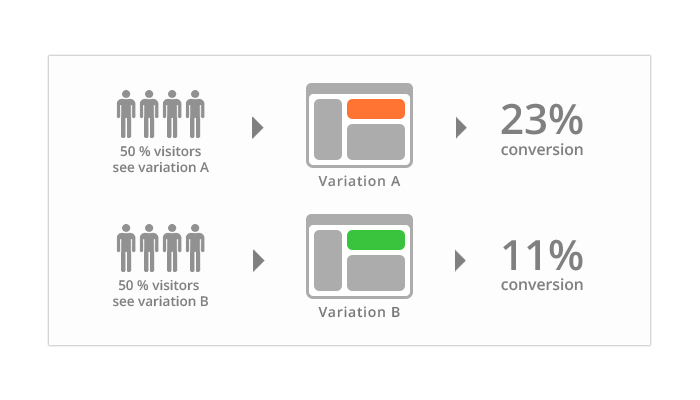 Let A/B tests to decide which of your designs is better for the visitors. Then you can use Multivariate Tests to “fine tune” your conversion rates and your pages one by one. Web Optimization 12 Apr 2016 SEM is one of 6 agencies in the world awarded with Optimizely Strategy Certification!